I wasn't quite sure I had a picture for this week's I heart Faces theme. Then I remembered the photoshoot I did with Brayden when he was 11 months. His one year birthday was coming up, and the theme was firetrucks, so I brought him to a local firestation to take some pictures. This ended up being one of my faves from the shoot. 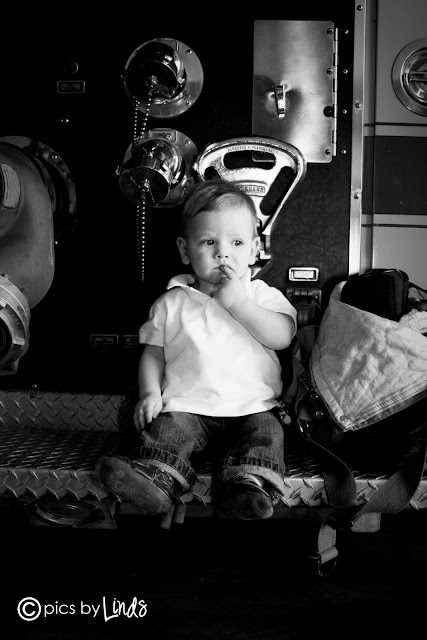 I just love his expression, and the textures and equipment of the fire truck really pop with the black and white. Be sure to check out the other vroom vroom entries by clicking on the i heart faces logo above.